Perhaps one of the aspects I enjoy most about leading seminars (i.e., teaching) is the opportunity to revisit the same concepts year after year. For example, in the six years I have led the Museum Practices seminar in the Museum Studies Graduate Certificate Program at the Univeristy of Memphis, students have evolved from all but throwing tomatoes at me for even suggesting the notion of a virtual museum to, particularly with the advent of the Google Art Project, a thoughtful exploration of the concept. Similarly, in part based on the mix of enrolled student home departments whether History, Art History, Anthropology, or Earth Sciences, the discussion of repatriation as exemplified by the Elgin Marbles incorporates differing dynamics. For the past two weeks we discussed visitor experiences and evaluations in museums. We read a range of materials including the relevant portions of ICOM’s Running a Museum, evaluation guides, standard readings and newly published offerings. I always enjoy revisiting the tremendous resources available at the Visitor Studies Association on this subject. Each week students submit an annotated reference on a resource relevant to the week’s discussion theme. We discuss a few of the resources in class. For me, the student references are one of the most enjoyable parts of the weekly seminar. The readings cover the basics. The annotated references allow us to go off in some interesting directions. The Museum of Science in Boston put out a call for public evaluation of accessibility for new exhibits. The museum is “currently gathering feedback about several of our new exhibits to improve the museum experience for visitors with disabilities. Scheduled for this testing are exhibits about energy conservation, the science of Pixar, and health & human biology. We are seeking visitors with a range of disabilities (including, but not limited to, sensory, physical, and cognitive disabilities) to help us test these prototypes.” Whereas exhibit designs always pass muster with consultants, the proactive invitation of the general public seems different. In a similar vein, students at George Washington University’s Museum Education Program created a wiki on issues related to accessibility. I was particularly impressed with the role graduate students played in this latter process – creating a useful and accessible first stop tool in assessing visitor special needs. I was also struck by the way a $200,000.00 prize was awarded recently at the Grand Rapids Art Museum in Michigan. The winners of Art Prize 2012 were determined by 400,000 votes of the “viewing public” over a several week period. Although a growing trend in such competitions, our seminar discussion suggested the Grand Rapids event is certainly in the forefront of this movement. Public Value: From Good intentions to Public Good by Jeanne Vergeront is a thoughtful discussion. She writes that “Public value isn’t a new concept. . . Relevance and community impact often refer to how a museum matters in its community.” The blog includes several links to presentations and articles that explore this concept. Teacher Creates a Museum in the Classroom reports the work of Keil Hileman’s who teaches archeology at Monticello Trails Middle school in Shawnee, Kansas. The blog has a brief discussion of Hileman’s methods with links to supporting agencies. The post is from the blog Homeroom by the U.S. Department of Education. The Museum Minute has a guest post titled Volunteer Engagement is Everyone’s Job by Carolyn Noe with a link to her Volunteer Management Daily blog. An interesting aspect of visitor/volunteer discussion in our class is how volunteers can be viewed on a continuum as more engaged visitors. And with Yelp, TripAdvisor, Rate My Professor could Rate My Museum be far behind? It’s here!! A theme in the submitted references is the movement from museums being collections driven to focusing on the visitor experiences. 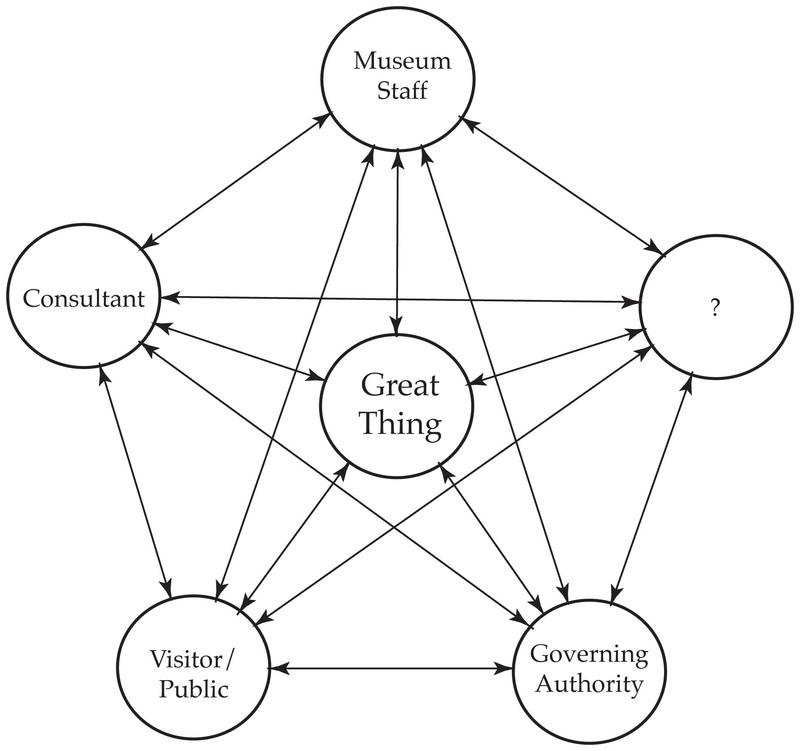 The public is increasingly involved in determining what that “great thing” of museums will look like and engage the visitor. This shift in engagement looks like the graphic below. Who gets added to “?” slot?